As a way to say thanks to our loyal readers, We Love DC will be giving away a pair of tickets to a concert to one lucky reader each week. Check back here every Wednesday morning at 9am to find out what tickets we’re giving away and leave a comment for your chance to be the lucky winner! 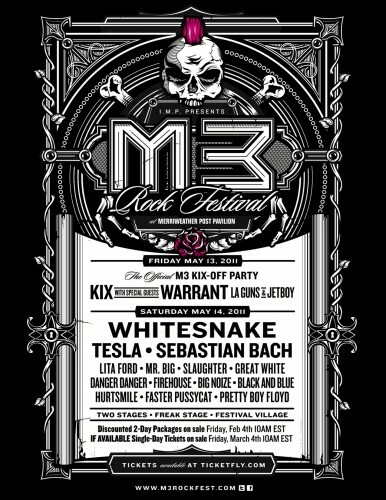 This week we are giving away double trouble with a sweet two-part M3 Rock Festival Prize Pack. That’s right, one lucky winner gets a pair of tickets to the M3 Rock Festival Kix-Off Party on Friday, May 13th AND a pair of tickets to the day long 80′s rock extravaganza M3 Rock Fest on Saturday May 14th! Between these two epic parties you’ll catch the likes of Kix, Whitesnake, Lita Ford, Tesla, Slaughter, Warrant, L.A. Guns, the one and only Sebastian Bach, and many more! That’s more hair metal than you can shake a can of Aquanet at! So enter to win tickets to this insane event that celebrates the days when Metal meant crushing a beer can on your forehead, driving donuts in a Firebird in the High School parking lot, and playing air guitar to music made by men who had spent more time on their hair than the ladies! This one’s going to be be balls to the wall, wicked awesome, and seriously bitchin’!